The Kaki-iro, is a vivid dark orange color, such as the persimmon fruit. Kaki-iro is the color name in a long time, but there are four types of color only be referred to as a “Kaki-iro” to bite, color of the two-dyed in the colors of the system and the persimmon named after the real color of persimmon divided into system. The Kaki-iro of the actual color of the lineage of persimmon, general color swatch “Kaki-iro”. And, dark reddish reminiscent of the fruit of ripe persimmon “Terigaki”. This Terigaki-iro is for short called “Kaki-iro”. On the other hand, as a system of color was dyed, et al. 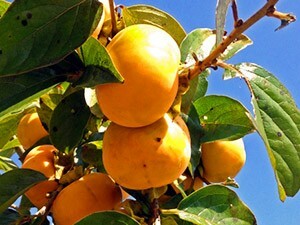 In the persimmon, the name also has a color name “Kakishibu-iro”, was called “Kaki-iro” here even for short. It is called “Kaki-iro” from further in the kabuki term brown “Naritaya”, known as “Danjurocha” was also dyed with persimmon juice and red pattern. In this way there are four types of commonly known as “Kaki-iro”, the Edo period previously “Kaki-iro” Speaking of which points to the only Kaki-iro of persimmon juice, reddish orange that dull named after the fruit of the persimmon but, it is not clear what time since I came to be called “Kaki-iro”. By the way, the medieval warrior priest who had been trained in the costume of Kaki-iro, because there is a waterproof effect to the persimmon, Will had been dyed so as not to wet clothes when over the fields and mountains.